After much planning and hard work, we are excited to announce the launch of our newly designed website. The update includes easier navigation, better structure, cleaner design, our new e-commerce store, and a personality that represents our identity as a company. During our design process we wanted to make sure that visitors to our site will have an easier time finding and understanding information. In addition to a brand new, streamlined, and modern site design, we also restructured our site map and rewrote the majority of our content, making things clearer, simpler, and more representative of how our company is growing and evolving. As a consultancy, we are only as strong as the people working with us. This is why we’ve expanded our site to include professional photos and short bios of our entire team – from management to our current COOP students. You can visit our team page to learn about who makes us who we are. At Global Advantage we take pride in our weekly blog posts. It allows each and every member of our team to express their thoughts and feelings on subjects our company is involved in. Our blog post also helps us communicate and update our customers. We aim to keep our readers engaged and interested in reading our latest blog post to see our latest activities as a company. You can check out our blog section weekly for updates. Something that has been highly desired from our clients is the shop page. We are currently offering 6 of our ecosystem maps to purchase online. Clients can order maps quickly and easily, from any location, and receive the maps in the mail within 48 business hours. 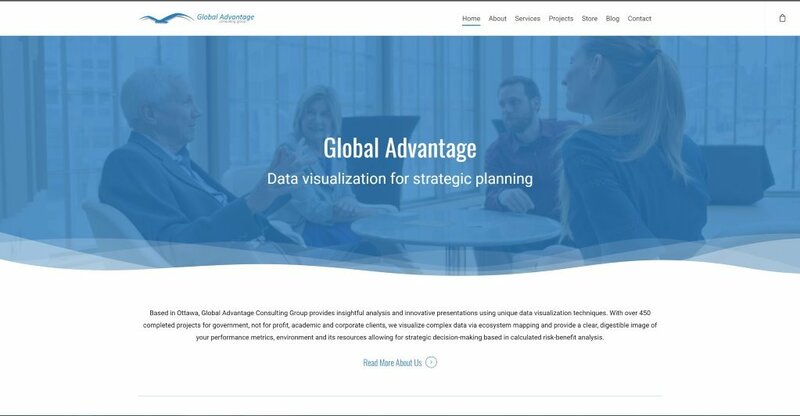 Overall, our hope with this redesign is to improve user experience and give a better representation of ourselves, the Global Advantage Consulting Group. As always, we are always open to suggestions for any improvements we could make to help ensure that you get the greatest experience possible when visiting our site.